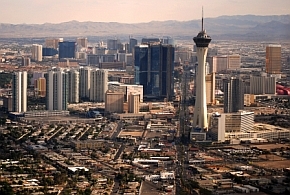 In southern Nevada, Las Vegas has over a half-million residents and lies in a metropolitan area of close to 2 million people. As The Entertainment Capital of the World, most of its economy is based on tourism, gambling, hotels and adult entertainment. The metropolitan area sustained the country's highest unemployment rate of 12.7 percent December 2011 among population areas over 1 million. Total non-farm job growth was 0.5 percent through 2011 demonstrating it is pulling out of the recession morass toward recovery. Most job sectors but other services and government reflected continued declines. Leisure and hospitality demonstrated impressive winter gains that fell but remained an improvement over year-to-year figures. Companies that have seen steady income such as Wynn Resorts, Las Vegas Sands, MGM Resorts, and Caesars Palace are using capital to reinvest and slowly expand. Las Vegas Motor Speedway has seen some job expansion with momentum growth in the NASCAR world and nontraditional revenue sources. Unemployment is respected to remain high in the area challenging hopes of job seekers. Foreclosures will continue to be the city's Achilles' heel, making it among the worst hit in the country and negatively affecting construction and manufacturing sectors, slowing overall growth to 2 percent.